This week-end is my Online Quilting Group's Retreat well we are all around the World so we do it online & post & show what we are doing. Myself on Saturday I will be at my Quilting Group so will be out for the day but still quilting. 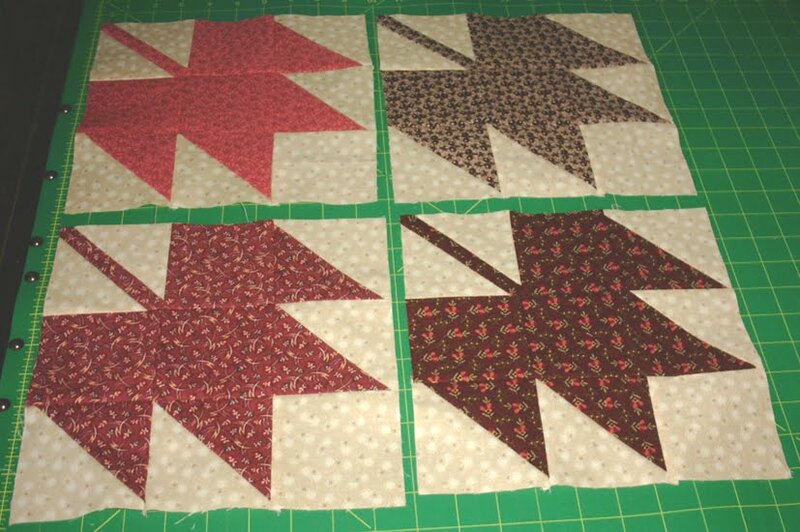 The retreat starts from Friday until Sunday & we have a block lotto this time round it is the Maple Leaf Block below are 4 that I done. I must say this is a block I do like I think it would make a great quilt or runner or just about anything don't you agree. 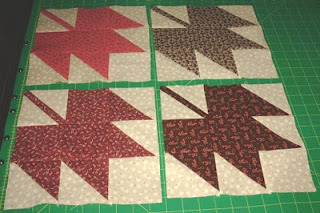 I do love the Maple Leaf block (even though I have not made any yet lol) and yours look great. Love the fabric choices. I love the maple leaf block pattern. I've made them before, but never for myself. I love this pattern, too. I have 49 maple leaf blocks. Seeing yours makes me want to finish the big quilt. I used the maple leaf block in my quilt "Leaves Around the Cabins) and I love it. Yours look wonderful, the colours are lovely. Have a great retreat. I have always loved maple leaves, and they are perfect for fall!